Tarot, when used properly is designed to help us look at ourselves and our situation(s) with honesty. Sometimes this can result in answers that are confusing, difficult to absorb, or that leave us with even more questions than before. How do you deal with difficult readings to gain more understanding? Below are some situations that occur from time to time and how to deal with them. You draw a card and it doesn’t seem to fit with the situation you asked about. First, consider how you asked the question – was your question or area of focus clear and concise? Or was it somewhat scattered? Often when we are feeling anxious about a course of events our thoughts may be racing or we may be considering too many things at once. Try to narrow your focus to more specific areas of concerns. This may mean drawing one card for each particular facet of a question – or doing more than one reading. Here is an example. Susie is getting ready to open her brand new business. She is very excited and also very nervous, so naturally, her thoughts are kind of everywhere. She has a ton of questions in her mind, everything from the location, to people embracing her product, to profitability, timing etc. As you can see this can be broken down then into multiple questions. Chances are if she chooses only one card, she may be confused by the answer or feel she needs more details. In this case, she could first ask for clarification and draw a second card. If that doesn’t help and she still feels she has too many unanswered questions, the next step would be to sit down and write out all the questions that surround this particular subject for her. Then she could do a card or two for each question – or even a full spread like a Celtic Cross for example to gain understanding. You see cards in your reading you didn’t expect or don’t want to see. This can be difficult because sometimes answers are hard to hear at first. 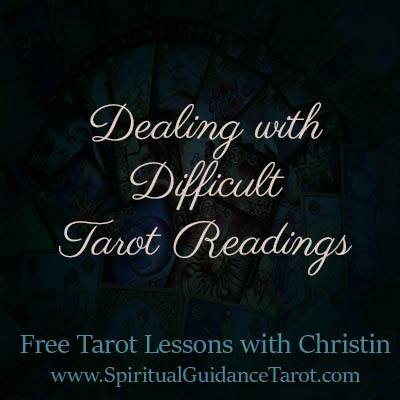 What you want in a Tarot reading is an honest assessment and when that honesty goes against what you presently believe to be true the first reaction can be “the cards are wrong”. There can be the temptation to draw and redraw again and again until one sees more of what they want to see. For this reason, I always suggest making a record and focus on the first reading drawn, especially if it seems a bit contradictory because chances are it is providing you some much needed objective advice or pointing out some flaws in your current thinking or experience. I have found over the years, that if you are tempted to ask the same question over and over again – it is likely because of a lack of objectivity or an unwillingness to hear a message. When this happens work to remove yourself a bit emotionally from the situation for a day or so and then go back to your cards and look at the spread again. Perhaps with a bit of time, the cards will make more sense. If after that the answers are still unclear, do another reading or seek another opinion. There are times where even professional and/or experienced readers benefit from having a reading done by an objective third party. Remember that there will always be those times in life where things may not go according to the plans we made or as we were certain they would. Instead of feeling defeated by this, choose to look at it as an opportunity to consider all the possibilities or open up to new angles you may not have considered otherwise. Every situation, even the challenging ones, provide us with opportunities to grow and learn if we seek them out. This is where Tarot, even the difficult spreads, offer us great personal development potential.